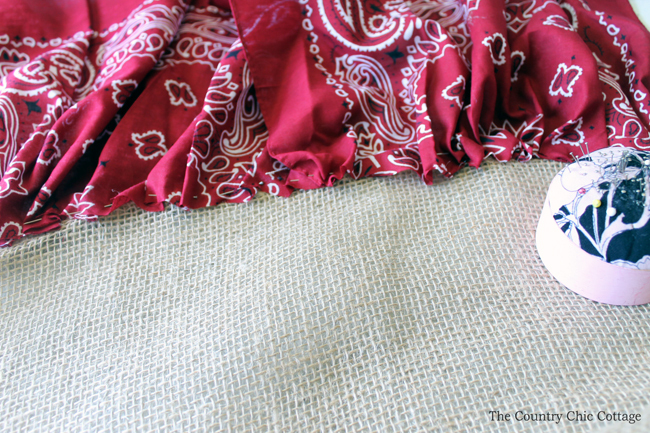 A summer burlap table runner is perfect for parties, backyard barbecues, or just to keep on your table all summer long. I knew I wanted to make a burlap table runner for summer. I then had the brilliant idea of adding a bandanna to one end! This fun idea is a quick and easy sewing project and will look great in your home. 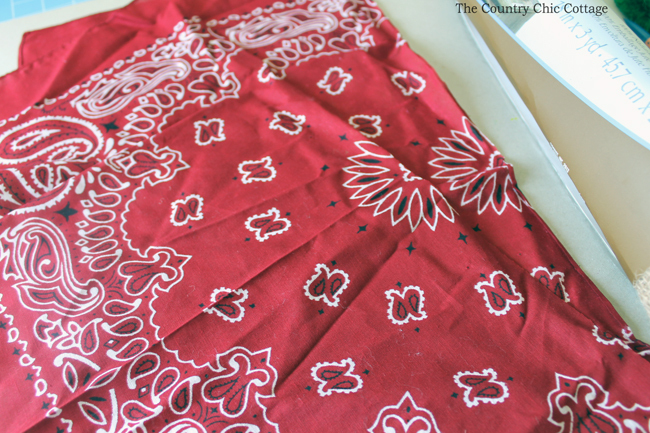 Start by cutting the bandanna in half as shown below. The bandanna I had was square so I just cut down the middle. I then pinned the raw edge along one end of the burlap table runner. I gathered it to fit. This way once you sew you will have a ruffled appearance on this end. Sew along the pinned edge with your sewing machine removing the straight pins as you go. 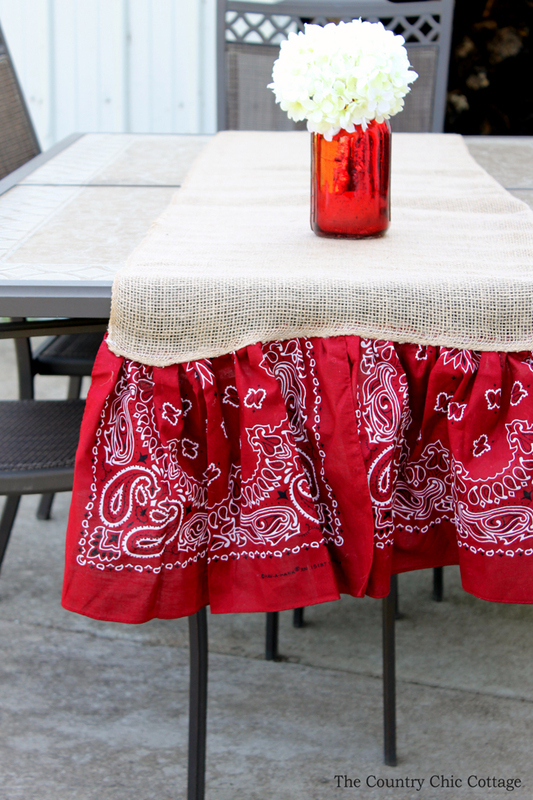 Your summer burlap table runner is ready for a party. Yes it really is that simple! 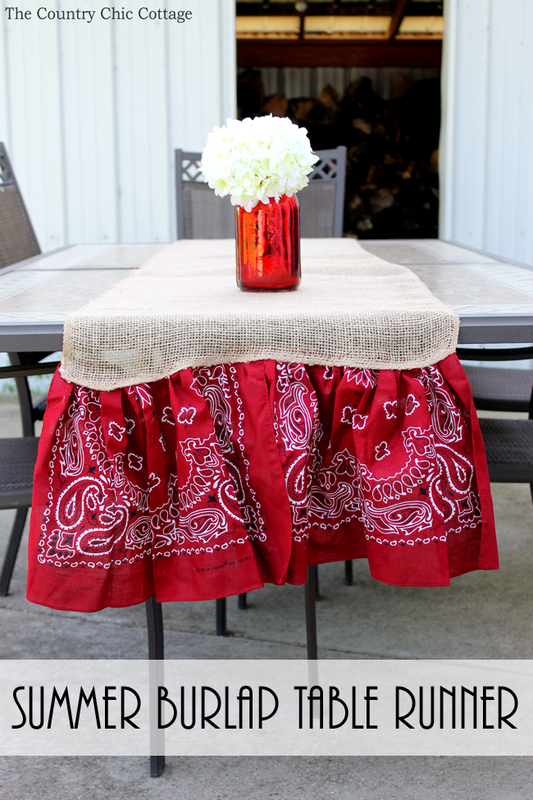 I love how easy this project is and the fact that it will look great at your summer parties. Be sure to pick up the supplies so you can make one for every table. 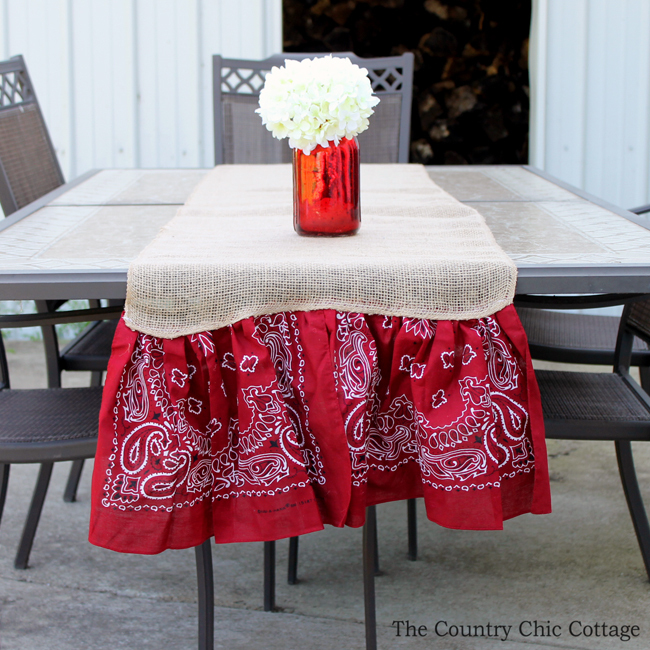 Your summer burlap table runner will be the hit of the party! Love this and looking for more ideas for your summer barbecue? Well we have those for you as well! 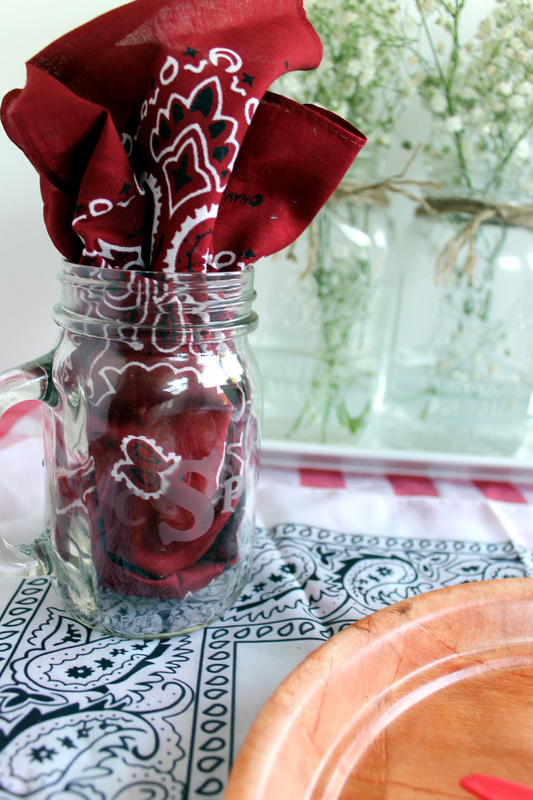 We used more bandannas and styled a fun summer party over at the Old Time Pottery blog. Be sure to click here to get more ideas that your guests will love! Angie I love the table runner! It turned out beautiful! Awesome idea! I pinned to my summer birthday party board and may have to whip some up soon! Very cute! Great clever idea to make quick table runner. Now why didn’t I think of using bandanas for a ruffle? DUH, LOL. Really cute and appropriate for summer relaxing, you talented lady you. Do you ever sleep or is your brain going 24/7? So much cuteness and talent oughta be against the law. Thanks! Super easy to make too! I do sleep….sometimes…. Hi Angie what a pretty table runner. You have made it extra special with the addition of the bandanna. It adds such warmth and color. I am hosting a new link party called Sweet Inspiration. We welcome all types of blog posts and would love to have you join us. It runs Friday till Tuesday. 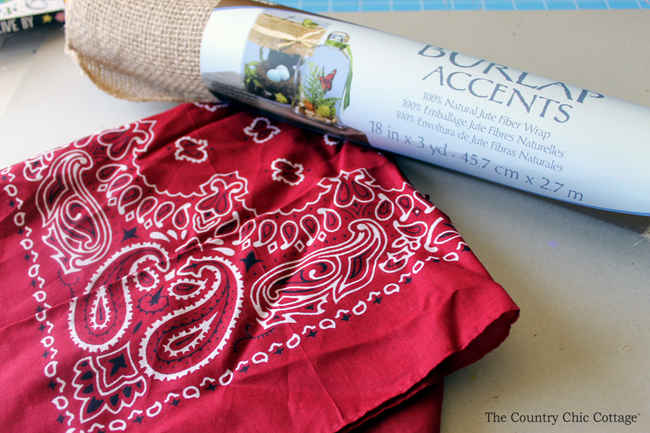 I love how you paired the bandana with the burlap! Super cute idea. I’m ready for some summer sewing. Thanks for sharing at the Inspiration Spotlight party. Have a great week ahead. Pinned & shared. This is such a neat idea and looks too cute!